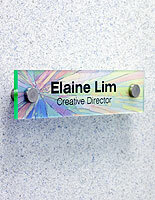 These door signs for office or business are a great choice for the do-it-yourselfer. Design and print original, unique graphics for your doors or wall. 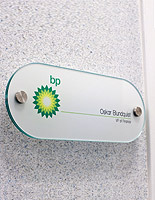 The door signs offer sleek design which looks great in the workplace. 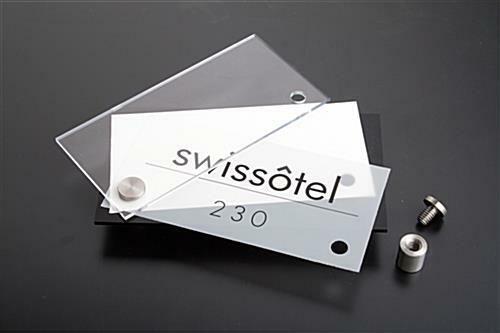 The package comes with the acrylic plates, standoffs, and printable film. 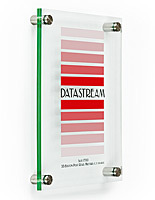 These door signs with standoffs are priced well below other manufacturer's versions. 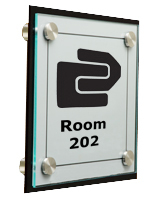 Create your custom artwork whether it's a company logo or simple room designation. The door signs feature downloadable art templates accessible below on this page. 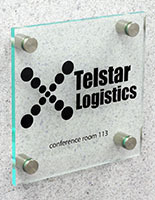 Your original graphics are printed onto the supplied frosted film. 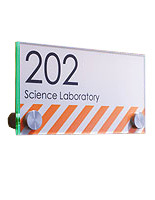 These door signs feature white cardstock which is placed behind the frosted film. This guarantees your artwork remains bright and white. The order of assembly starts with the black acrylic panel, then the cardstock, the printed film, and finally the clear acrylic top plate. The two standoffs lock the assembly in place. These door signs, personalized name plates, add upscale decor to your interior simply with the addition of the black back plate, which frames your signage attractively. 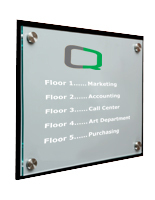 Use this do-it-yourself kit for business logos, conference room numbering, or any other application as you see fit. Flexibility is the key! 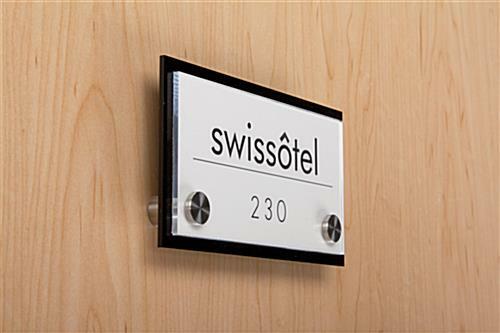 The door signs are intended for small applications with an approximate size of 6" x 3". 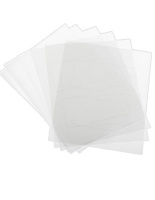 (3) sheets of printable frosted film are included with purchase and each sheet holds two sign blanks. These door signs are very affordable but certainly don't look it! These were a very nice product. They ended up being too big for us but otherwise, they are good.